The following gives advice on what to look out for when looking at a second-hand Mirror and on how to go about finding one. 1) Take a sharp knife with you and examine the floor of the cockpit, especially around the centreboard case, for rot (is the wood firm and resists the point of your knife or is it spongy so that the point goes in easily?) In the same way check the glued joins at this point. Most Mirrors are varnished inside so you can see what the wood is like. Beware of one which has been painted inside, this may have been done to hide signs of rot (dark staining of the wood). 2) Are there any other areas you can see which are stained black under the varnish? This may be a sign that water has penetrated the wood. Again check with your knife in case it is spongy. Some staining of this sort is inevitable with any old boat and will be OK if it has not gone so far as to rot the wood. 3) Look out for any de-lamination of the ply (one layer becoming detached from another). This is a sign of advanced decay and will be expensive to repair (it may need a replacement panel). Examine the glass tape on the seams and joints. It should be the same colour as the surrounding ply. If in places it appears to be milky white it means it was not properly soaked with resin at this point and has become detached from the wood. It should be possible to replace the tape but the work necessary needs to be taken into account. 4) Examine the outside of the hull for signs of damage at the corners and at the edges of the chines. These should all be sharp and (except for the chines near the bow) at fairly acute angles. If they are rounded at some point this may be a sign that the boat has been damaged (dropped on a corner, perhaps, or hit by another boat). All the panels should be evenly curved so look along them at a fairly flat angle to see if there are any bumps or hollows. These could be where the hull has been holed and patched with filler. Again check carefully around the dagger board case from outside. Repairs to the hull may not be serious if they have been done properly but talk to the owner and try to find out how the damage arose and how it was repaired. At the end of the day only you can tell if a repair is acceptable or not. 5) Squat at the stern and look from the stern transom towards the bow transom. The tops of these two transoms should be exactly parallel with each other when viewed from this angle. If they are not this means the hull is twisted. This could be a sign that the boat was not built properly to start with (not kept flat while the glues and resins hardened) or left for long periods half full of water. The amount of twist may not be serious unless you want to race the boat (you will never get good performance from a boat with a twisted hull). Again only you can decide what is acceptable. However, if you do spot a twist, which may be the result of water lying in the hull, go back and check the earlier points again. Water left lying in the bottom of the cockpit is the Mirror's greatest enemy. 6) Finally, do not worry too much about the condition of spars (mast, boom and gaff), foils (rudder blade and centreboard) or fittings. These can easily be replaced. However, do point out problems with these to the owner and try to get a reduction in the price to cover the cost of replacements. The price of a second-hand Mirror depends on how well it was built, whether it was built for racing, what condition it is in, whether it has a measurement certificate and what extras it has, rather than on its age (sail number). For example, a successful racing boat built by someone with a reputation for building fast boats will often fetch well in excess of £2,000 even after several seasons' use. 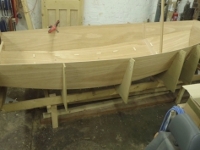 A boat of the same age but built by an amateur and knocked about a bit might go for no more than £200. A boat built by Widebeam or one of the other licensed kit assemblers usually goes for a bit more than a similar boat built by an amateur because the purchaser knows it will have been built to a good standard. But a kit boat built privately with real care and attention to detail can be even better. Although, as explained above, the sail number is not the most important thing to consider when assessing the value of a boat, it is often the only thing you have to go on when looking at an advert. In such a case a number over 60,000 might go for between £600 and £1,000+. For numbers between 40,000 and 60,000, £300 to £500 would not be unreasonable. There is a table indicating the age of a boat from its sail number. Boats with sail numbers of less than 40,000 are usually either very good or very bad, depending how they have been looked after. The bad ones may have rot in the bottom, de-lamination of the ply, deterioration of the taped seams, or a twisted hull. However, the good ones often fetch as much as those with sail numbers over 40,000 since age is not the determining factor. 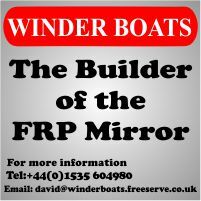 The best place to find or sell a second-hand Mirror in the Boats for Sale section on this website where boats which are for sale are listed in price categories. The "5 latest boats for sale" appear on the website front page (and other pages) on the left. If you want to advertise your boat, deails of how to do this are here. It's free, but a donation from non-members is always appreciated. If you want to place a "For Sale" or "Wanted" advert for some gear, details of how to do this are here. Other places worth looking for boats or gear are Apollo Duck and E-Bay. You can tell the approximate age of a boat by the sail number.